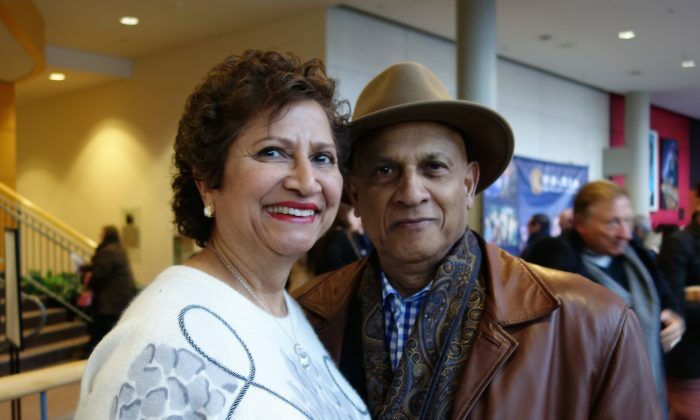 MISSISSAUGA, Canada—Writer Awadh Jaggernath and his wife, Rani, were overflowing with praise after seeing Shen Yun Performing Arts’ second straight sold-out performance at the Living Arts Centre on Saturday afternoon. “These guys are masters,” said Mr. Jaggernath. “I thought it was fascinating, just absolutely awesome, beautiful,” said Mrs. Jaggernath. New York-based Shen Yun presents to its audiences 5,000 years of Chinese culture through the universal language of music and dance. The performance of the world’s foremost classically trained dancers accompanied by a unique orchestra blending East and West makes for an incredible spectacle. Mr. Jaggernath, now retired, just completed a book about the first 21 years of his life growing up in Trinidad. It will be published in about a month through Mosaic Press. Mrs. Jaggernath, also retired, used to be a marketing analyst for Sears Canada. The couple live in nearby Oakville. Just as Mr. Jaggernath, being a writer, is skilled at using words to convey a vivid image of a scene or situation for the reader, he was also appreciative of another hallmark of Shen Yun—the digitally animated backdrop that is used to skillfully portray vivid background settings for the showgoers. “That background blew me away. … I don’t know how they did it,” he said. Through state-of-the-art graphics technology, Shen Yun’s digital backdrop team creates spectacular landscapes that strikingly reflect China’s geography. Moreover, “These digital backdrop designs complement and synchronize all aspects of the performance: the characters, colour of the costumes, specific dance movements, props, lighting,” according to Shen Yun’s website. “The colours are something else. These are fantastic colours. The rhythm, the dancing, harmony, it was just flowing. As they said, there’s divine movement,” said Mr. Jaggernath. The main form of dance on display is classical Chinese dance, an ancient art form that has been passed down over thousands of years. “It has become a complete system of dance embodying traditional aesthetic principles with its unique dance movements, rhythms, and inner meaning,” states Shen Yun’s website. Audience members also frequently note that they feel very uplifted after seeing a Shen Yun performance, as its presentation is true to the goodness and virtuous principles that lie at the heart of traditional Chinese culture. This aspect of the Saturday matinee performance made a strong impression on the couple. “The messages—the compassion, the divinity, and spirituality—I think was so well done,” said Mrs. Jaggernath. New York-based Shen Yun Performing Arts has four touring companies that perform around the world. The Shen Yun International Company will perform four times in Mississauga before continuing on to Sony Centre in Toronto. For more information, visit ShenYunPerformingArts.org.